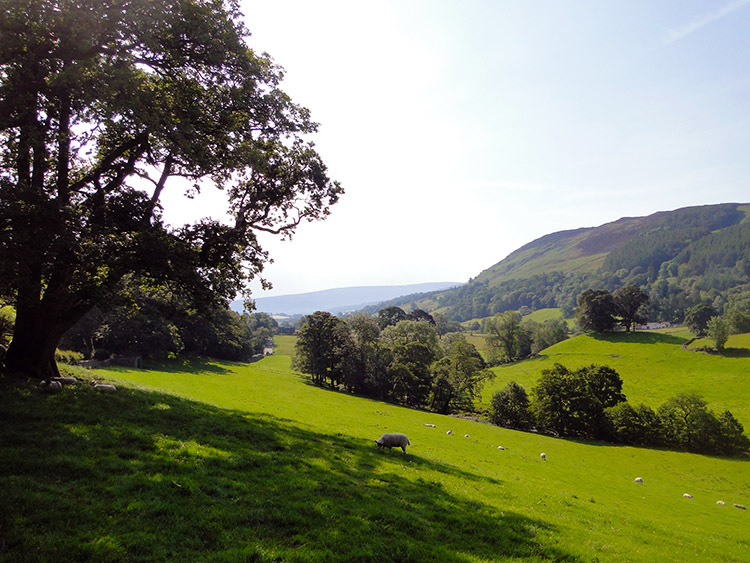 After six weeks of walking south the 41st stage of my walk took me back to familiar ground as I left Cumbria and reacquainted myself with my home county of Yorkshire. 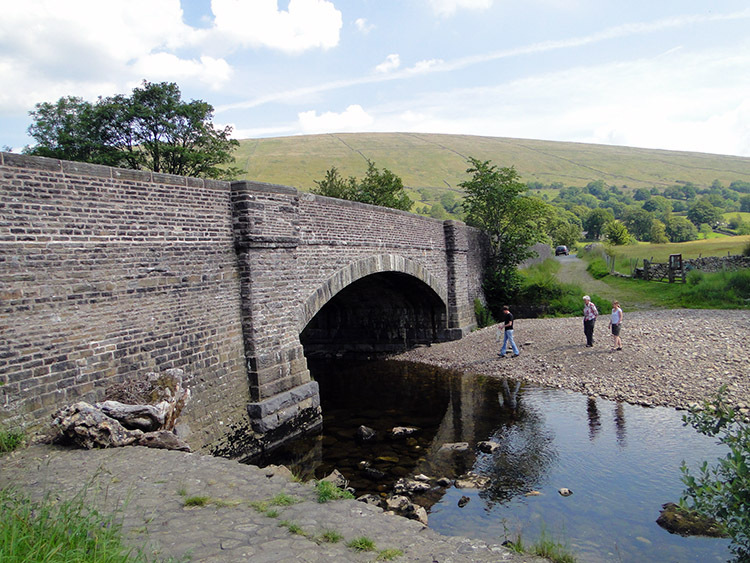 I remained in Cumbria for the walk through beautiful Dentdale before climbing to the county of broad acres by crossing Boot of the Wold on the edge of Whernside. Well known and much loved views to Ingleborough beckoned me into Yorkshire and on to the finish of this stage just beyond Ribblesdale at the remote farm of High Birkwith. After sleeping in a comfortable bed for the first time in a few days I was reluctant to rise but as the weather was continuing to be up to more than our expectations it spurred me on. 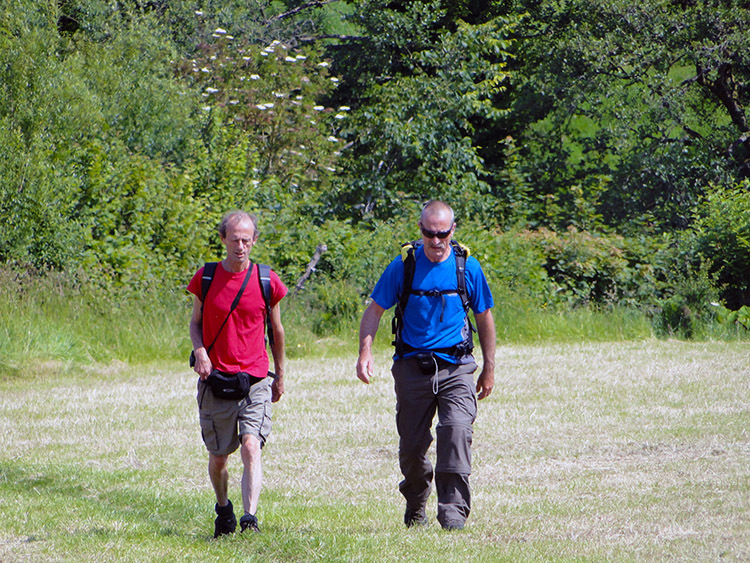 Dave and Steve were also keen to get started on the days walk. After breakfasting with Lil and Jan we kitted up and walking with light day packs for a change we trotted off confidently into the gorgeous environment of Dentdale. As a bonus I had no aches and pains for me now so the first plan was to enjoy Dentdale and then climb to the home county. The mistake of sticking to the road provided me with a great moment I would not have enjoyed had we left the road. I came around a corner at Catholes and in the nearby field stood a derelict barn. I took my camera out to take a picture of the barn when I saw a face peeking around a corner of the building. Can you see him? It was a magic moment as we looked each other in the eye. We stood becalmed for about a minute doing so before he got bored and turned away to hide behind the building. With a huge grin on my face I walked on to catch up with Dave and Steve. After catching up with them we continued ambling along the quiet road taking in the gorgeous views of Dentdale while the sun worked on the haze and heated up the early day. 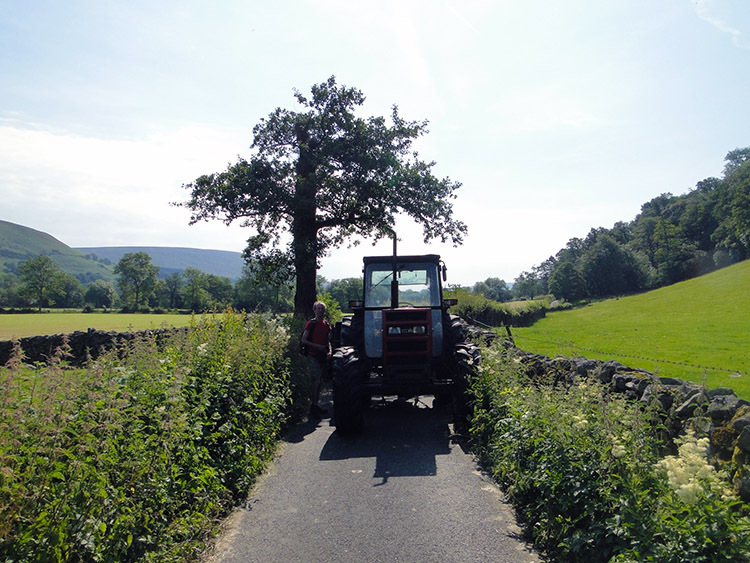 We left the Dentdale road at Akay Hill and crossed a field towards Brackensgill. We came to the River Dee which we crossed by a footbridge before meeting another quiet road. This one was barely wide enough for a vehicle and when we met a tractor coming our way we had to dive into the hedge back to avoid being run over. A bit of over-exaggeration perhaps; we shuffled past the stationery farm vehicle. After exactly one mile along the road in which we met nothing else we continued on the Dales Way across fields towards Dent. In one field all the sheep in it were aligned in a row nestled close to a wall and all taking cover from the sun. 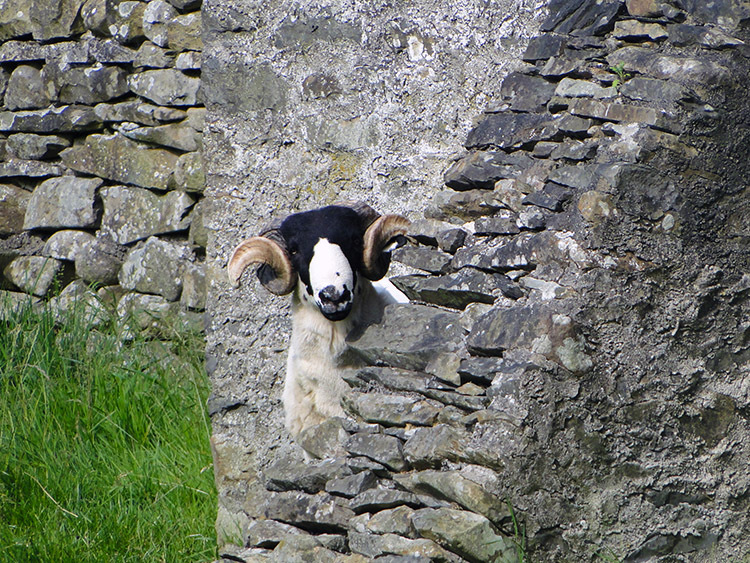 It was getting hot and being unsheared the shade provided by the wall was welcome respite. 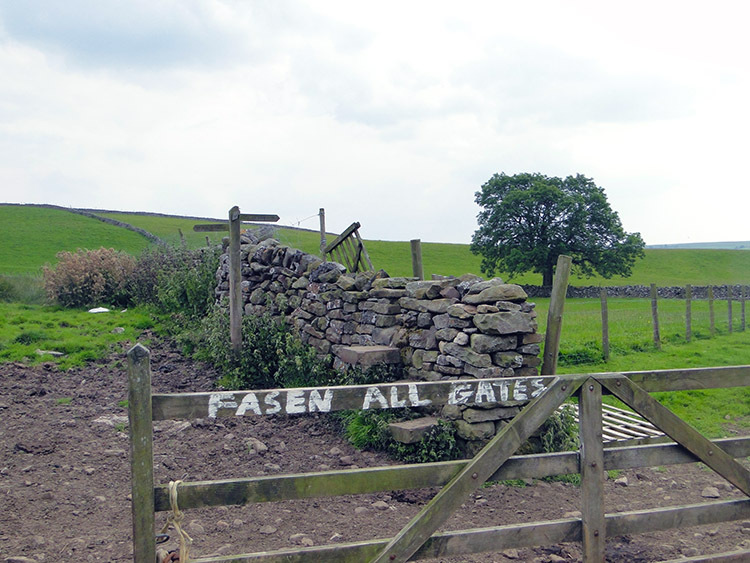 Another notable feature of this stretch of walking was that every gate, stile and footbridge had an engraved stone tile fixed to it. Featured engravings included a tractor, a fossil, leaf and flower, a rainstorm, a person on a bridge. They were entertaining diversions. 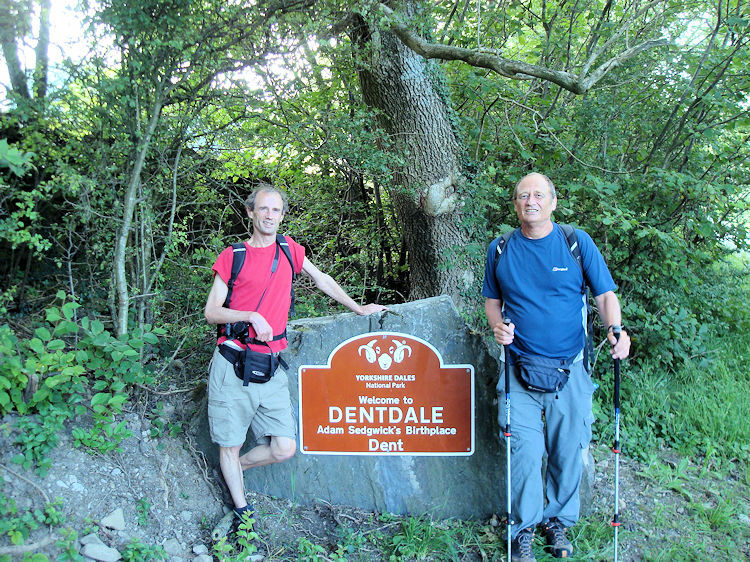 With the perfect weather, the entertaining diversions, the sparkling conversation and the natural surroundings we seemed to walk through Dentdale in no time at all. 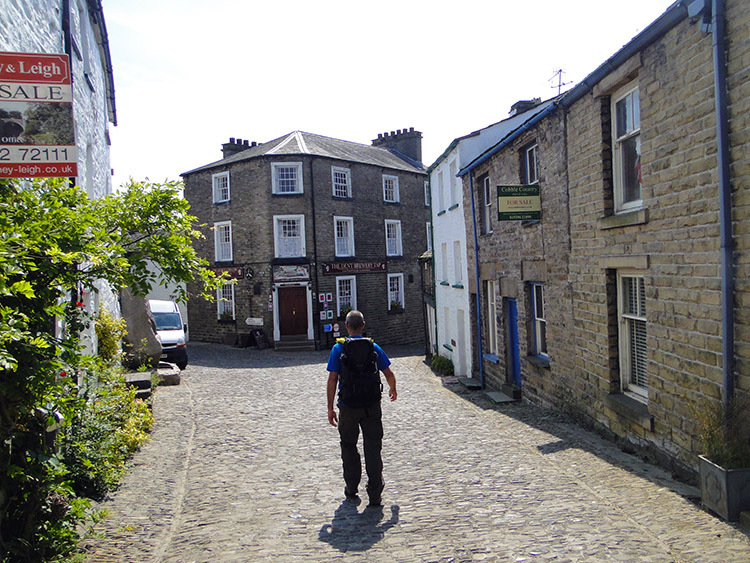 In a little over five miles of walking we strode into Dent. The village is special, a favourite of mine and liked by Dave and Steve too. We had stayed in Dent quite a few times during long walks and over long walking weekends. This time we were just passing through but we took the time to take a break in the village which retains a cobbled street running through the heart of it. Despite its diminutive size Dent has some notable claims fame. 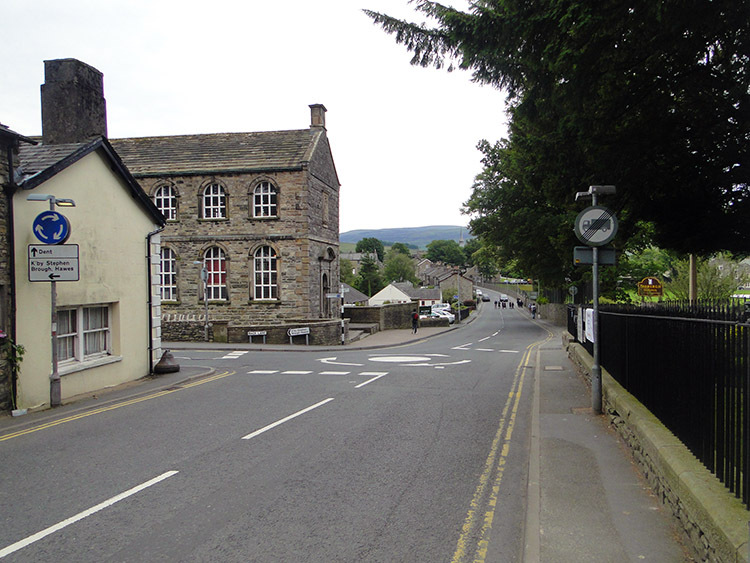 First, it was the birthplace of the geologist Adam Sedgwick who was born in the village in 1785 and to celebrate the bicentenary of his birth the Sedgwick Trail was created which follows the River Clough, highlighting rock features and exploring the Dent Fault which is a important feature in the evolution of the Yorkshire Dales. Second, Dent now gives name to a popular brewery which is based just outside the village in Cowgill. 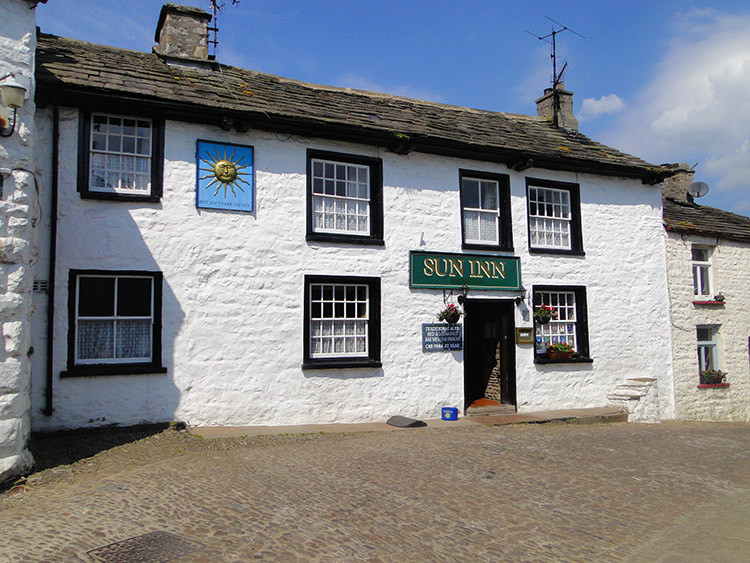 The two pubs in Dent are allied to the brewery. After taking in Dent we left by following the road to Church Bridge which spans the River Dee. From Church Bridge we left the course of the River Dee to cross a couple of hay fields and then to follow a path running alongside Deepdale Beck. 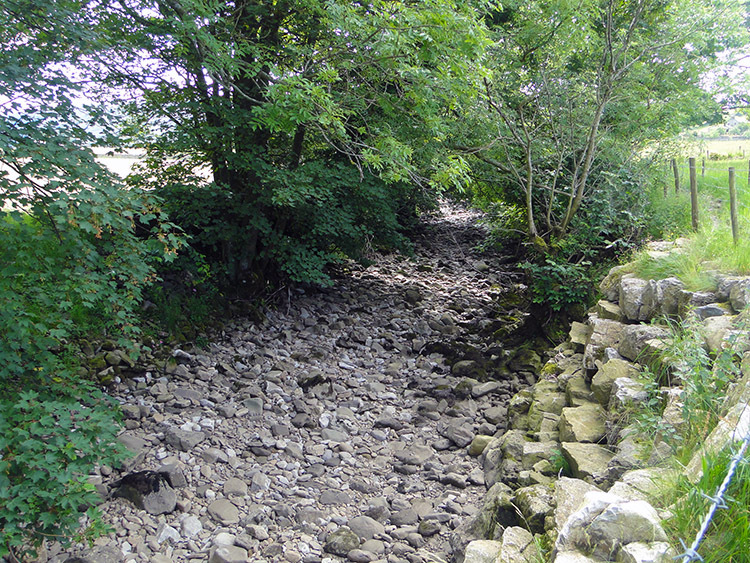 We could have walked in the middle of the beck as the shingle bed was completely dry. Water was running below ground but could not get to the surface. I was not surprised after walking for over a week in northern England in hot sunny weather and without a hint of rain. We left the course of Deepdale Beck at Mill Bridge and said goodbye to Dentdale by beginning the long climb from the head of the valley to Boot of the Wold. The climb is never too steep but it is relentless as 400 metres is climbed before crossing over into Yorkshire. 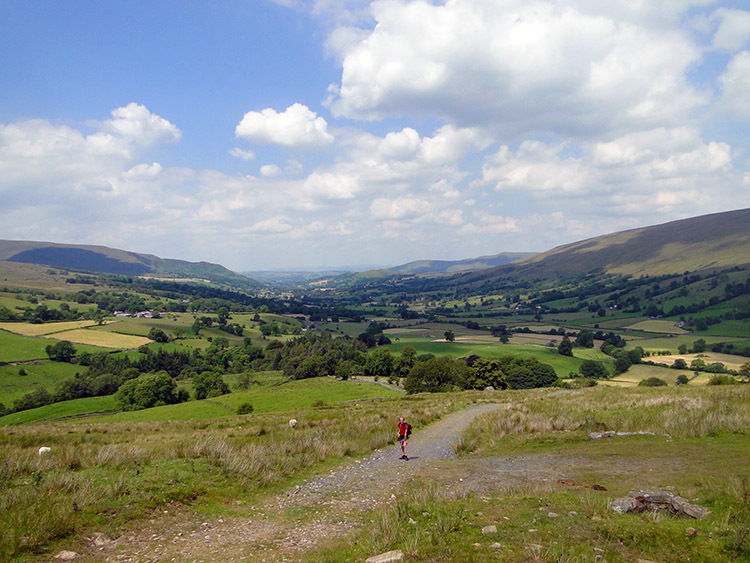 The compensation of the climb is to stop now and again and when doing so to turn back and look to Dentdale. It is one of the WOW views. Truly magnificent. 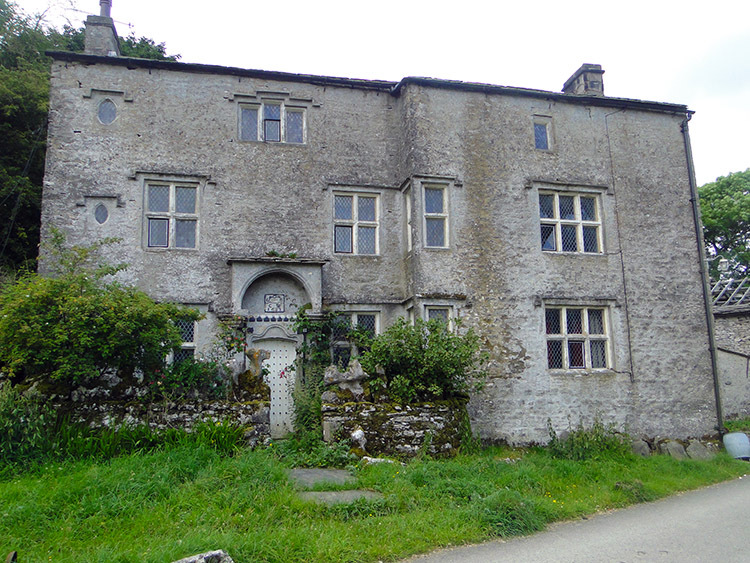 After climbing to Boot of the Wold at our individual paces we reconvened at a crumbling building. Here we sat for a while to take a drink, chat once more and capture the scenery. Especially striking from Boot of the Wold is the view east to Great Knoutberry Hill and Dent Fell. Nestled below the high ground are Artengill Viaduct and Dent Head Viaduct, two splendid engineering features of the Settle to Carlisle Railway Line. We would see another viaduct up close soon, perhaps the most famous of all on the line. 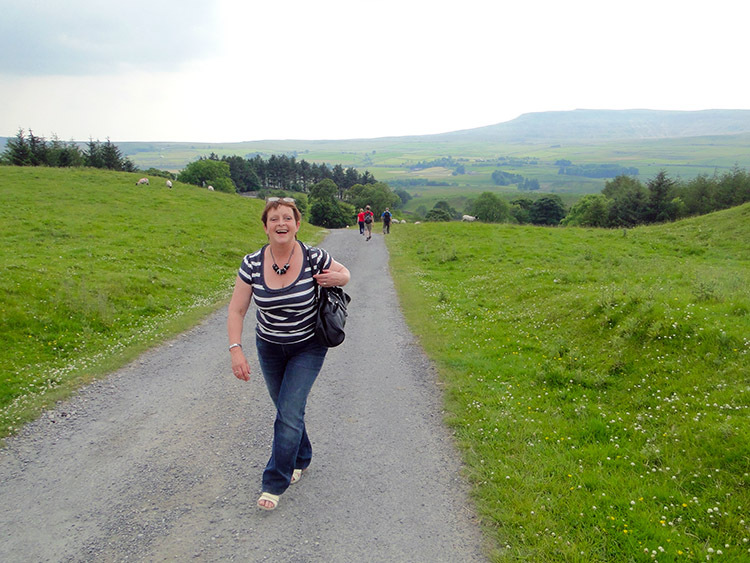 First though we had to cross into Yorkshire and we did so by dropping into Ribblesdale by way of Craven Wold. The descent of Craven Wold and Force Gill Ridge on the east edge of Whernside which is the highest of Yorkshire's three peaks is magic. 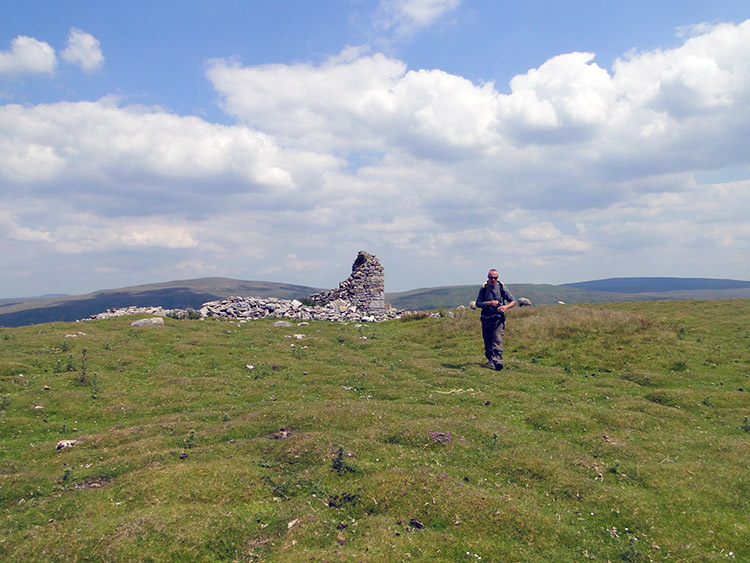 Once the summit of the path from Dentdale is crested and Duncan Sike Foot is passed then the views to the south open out. 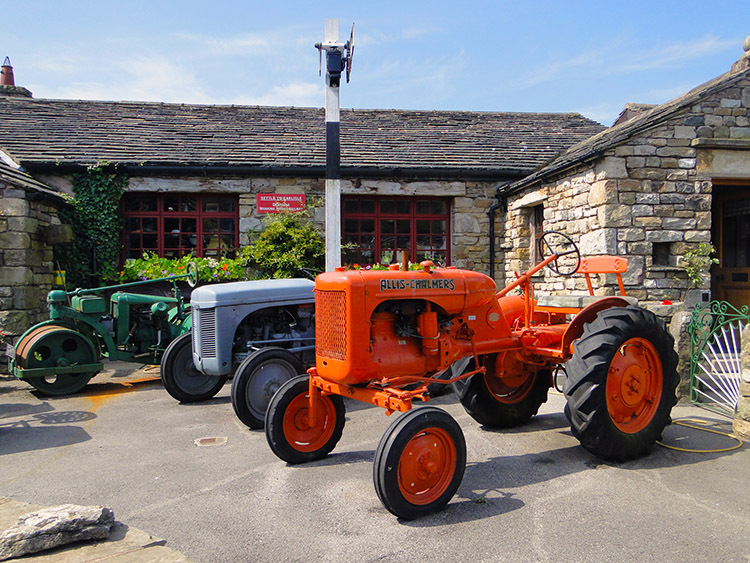 The Yorkshire Dales in all their glory are revealed. The presentation begins with an alluring view to Park Fell and then to Simon Fell. Continuing right from Simon Fell reveals the easily identifiable flat top of Ingleborough which is Yorkshire's premier mountain. 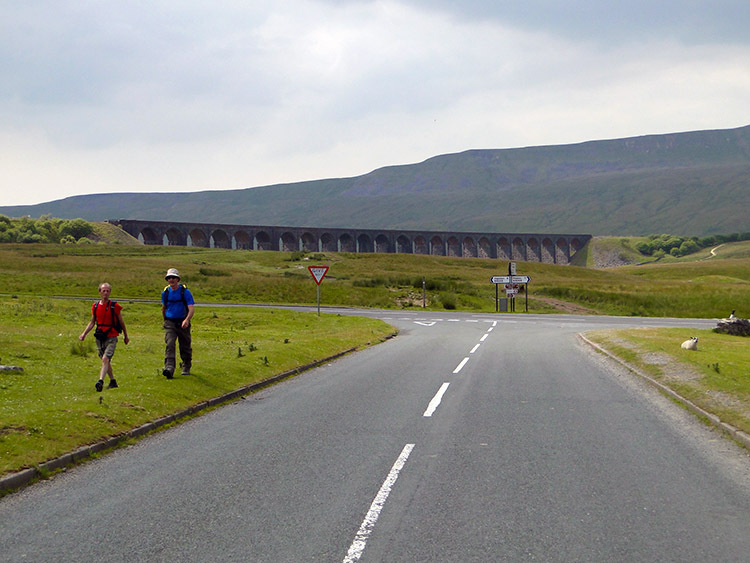 Slightly smaller than Whernside its shapely appearance and inspirational profile raise its popularity. 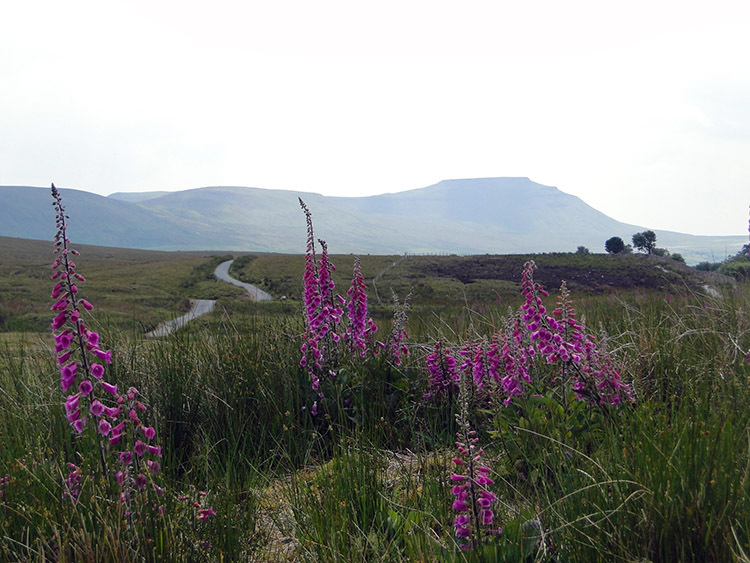 Ingleborough draws many walkers from miles around to climb it. We were not to climb it this time but the view was enough say "Welcome home". Oh, in my excitement I forgot to mention Force Gill and its great waterfall. Take a look. 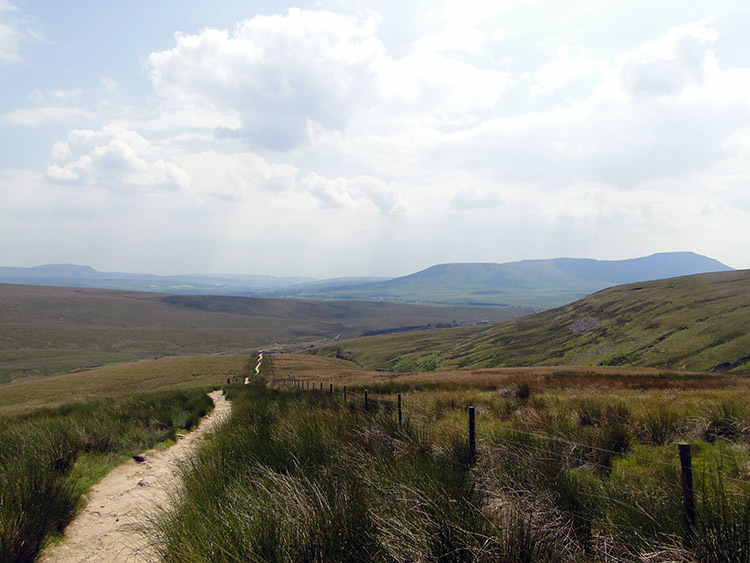 We strolled down the good path and while doing so greeted a few walkers climbing up Blue Clay Ridge and Smithy Hill as part of their personal Yorkshire Three Peaks walk. 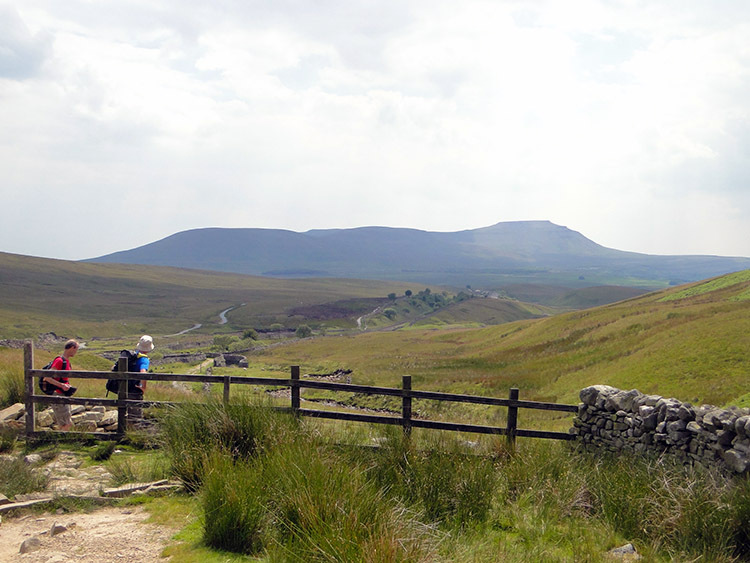 It is a gruelling 25 mile walk which involves climbing Pen-y-ghent, Whernside and Ingleborough and some we met looked like they were not going to make it. We encouraged them on as best we could. 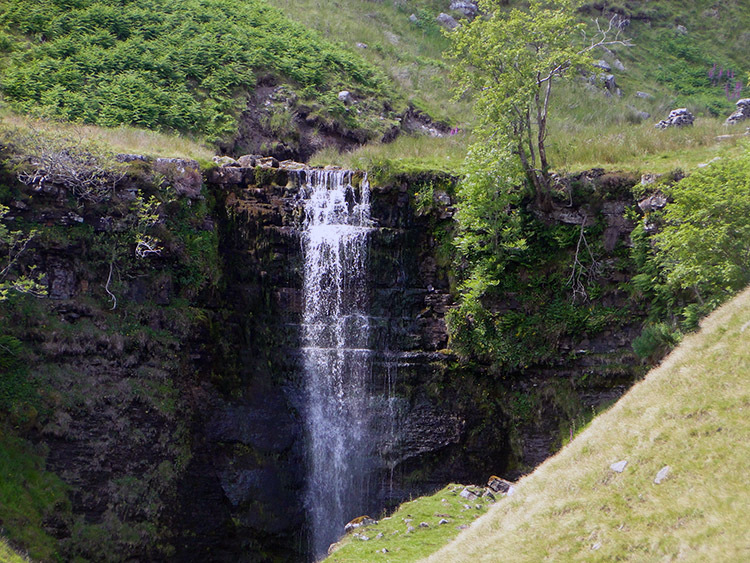 Our goal of High Birkwith was drawing closer but we still had Ribblesdale to thrill us. The famous Ribblehead Viaduct was enjoyed first from where we crossed the B6255 Ingleton to Hawes Road to follow the B6479 Gauber Road to Hunter Hill. For the first time in over a week darker moodier cloud was beginning to fill the sky. It was not threatening to rain and we knew we would finish in the dry but with the sun tucking itself in behind the cloud was this an omen of what we had to come? Dismissing such thoughts of the near future we continued walking in the present by leaving the road at Hunter Hill and following an access road down to Lodge Hall which is alternatively named Ingman Lodge on the map. At Lodge Hall a low hum prompted our attention. 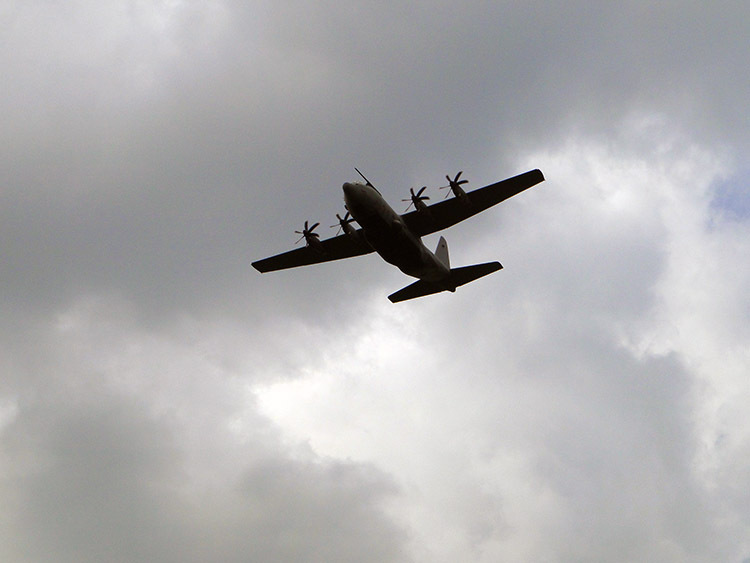 Looking up to where it was coming from a military transport plane came straight towards us and graced us with a fly past. Such events always stop us in our tracks and this was no exception. We walked on after it had gone. The final couple of miles from Lodge Hall to High Birkwith was on paths and tracks across low moor, high pasture and on farm access tracks. The first notable event was when we walked along a track and crested a small hill to see Cows in the field beside us. No fence was between us and the beasts. It was open plan. Looking into the herd who were motionless but eyeing us curiously we spotted a bull. To our relief he was off his feet and resting. Keeling a close eye on him just the same we were relieved to see he ignored us as we made our transit. Task safely accomplished. The final notable event of the walk was to meet up with two ladies. Lil and Jan were at High Birkwith to meet us and had made the effort to walk from where Lil had parked the car to walk up to Dismal Hill. So while Steve and Dave walked with Jan back to the car I walked with Lil. It was good and what was better was the fact I was going home for the night, the first night at home and in my own bed for seven weeks. I was only just approaching halfway on my walk but with being so close to home on my Great British Walk meant I could at least spend two nights in my own bed. Tonight would be the first. And after another excellent day of walking which had got me to the cusp of halfway on my course through Britain that was very special.